This project will address multiple deficiencies and issues cited in recent maintenance reports compiled in conjunction with the Commission’s annual bridge inspection reports. 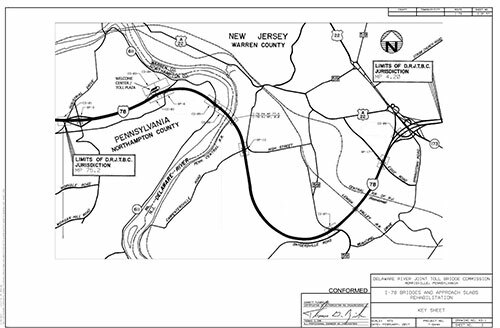 The Delaware River Joint Toll Bridge Commission’s I-78 Toll Bridge jurisdiction includes an additional 6.5 miles of approach highway that traverses western Warren County, N.J. (4.2 miles) and eastern Northampton County, PA. (2.25 miles). Interspersed along this busy roadway segment are a series of bridges and overpasses that also are owned, operated and maintained by the Commission. These bridge structures and the approach concrete slabs immediately flanking these structures are the primary focus of a multi-element project scheduled to be carried out between summer 2017 and fall 2018. The project will involve bridge approach slab replacements at eight bridge structures (relatively short-distance overpass/underpass type bridges), cleaning and painting at six bridge structures, and an assortment of other tasks, including restriping the Commission’s entire I-78 roadway segment. Various lane closures and traffic shifts are needed to carry out this project and motorists could periodically encounter congestion and delays due to anticipated project-related travel restrictions. Travel restrictions began in late August 2017 and will continue — with the exception of a hiatus during the 2017-18 winter months — until late 2018. The restrictions largely will involve protracted single-lane closures that will limit motorists to two travel lanes in a respective direction instead of the usual three travel lanes. However, there will be several weekends over the course of the project where the project contractor will need to restrict traffic along a respective direction of I-78 to a single-lane pattern instead of the normal three-lane configuration. 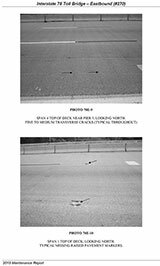 These single-lane patterns will involve intensified 34-hour work periods (8 p.m. Fridays to 6 a.m. Sundays) over select weekends when vehicular volumes are lower. Despite the reduced traffic levels, severe backups and travel delays remain likely. The latest travel advisory may be found in the Alerts section of this website. Construction activities are expected to begin in late July 2017. Initially, the contractor will conduct land surveys. Construction activities – along with corresponding travel impacts – are expected to get underway in August. Work will continue into December, when the project will go on a winter hiatus for the cold-weather months. Work activities are expected to ramp up again in the late winter/early spring and continue until project completion in fall 2018. 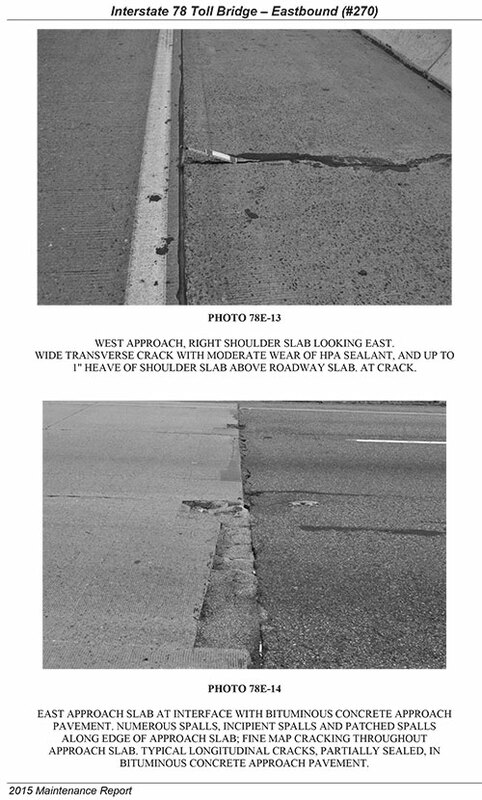 Precast Approach Slab Replacements: This work includes the repair and replacement of concrete approach slabs at various locations along I-78. 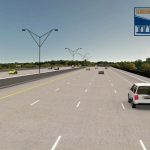 This largely will involve concrete slabs immediately before and after underpasses and overpasses within the Commission’s I-78 jurisdiction as well as at the I-78 Toll Bridge. 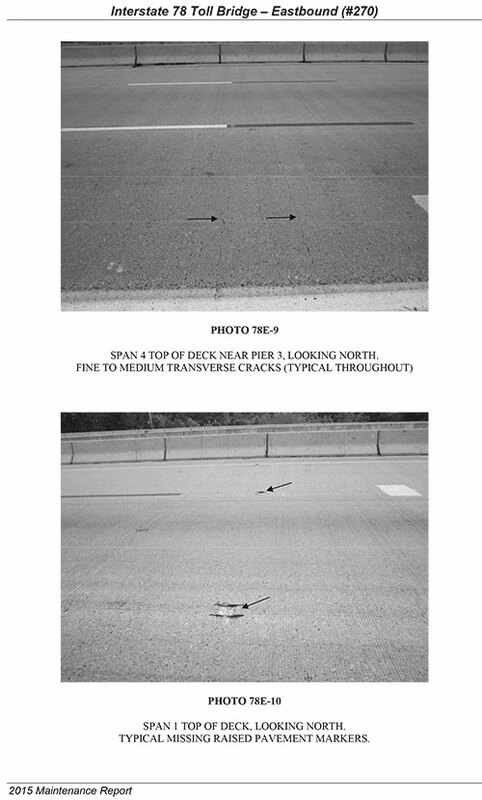 Painting Existing Structural Steel: This work includes the removal and repainting of six approach bridges in New Jersey: the overpasses that cross I-78 at Edge Road and Carpentersville Road, the dual-span bridges that carries I-78 across County Route 519, and the dual-span bridges that carry I-78 across an on-ramp from Route 22 at the Still Valley/Phillipsburg Interchange (Exit 3). 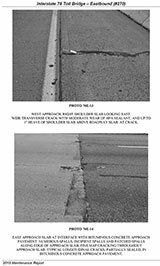 Asphalt Overlay and Regrading: This work includes an asphalt overlay of the existing roadways and proposed approach slabs at a dip along eastbound I-78 between the Route 611 overpass and the I-78 Toll Bridge. Deck Seal Coat: This work includes prepping the existing deck, performing miscellaneous spall repairs, and sealing the entire deck of the following I-78 jurisdiction bridges: Morgan Hill Road overpass across I-78 (PA); the service road ramp bridge at the Commission’s I-78 maintenance facility (PA); The Cedarville Road overpass across I-78 (PA); the dual overpasses that carry I-78 across Route 611 (PA); the I-78 Toll Bridge (NJ & PA); the Carpentersville Road overpass across both directions of I-78 (NJ); the dual overpasses that carry I-78 across County Route 519 (NJ); the Edge Road overpass across both directions of I-78 (NJ); and the dual overpasses that carry both directions of I-78 across the Route 22 ramp to eastbound I-78 at the Still Valley/Phillipsburg interchange (Exit 3) (NJ). Miscellaneous Substructure Repairs: This work includes replacement of a small bridge bearing at the Cedarville Road overpass across I-78 (PA), as well as spall repairs and abutment repairs at the dual-span overpass that carries I-78 across County Route 519 (NJ) and the on ramp to I-78 eastbound from Route 22 at the Still Valley/Phillipsburg interchange (Exit 3). Welcome Center Repairs: This work involves repairs around drainage inlets and concrete slabs in the public parking area for the I-78 Welcome Center adjacent to the Commission’s I-78 toll plaza. The project construction contract was awarded April 24, 2017 to J.D. Eckman, Inc. of Atglen, PA for a not-to-exceed amount of $11,117,003.61. The I-78 Toll Bridge opened to traffic November 21, 1989. The bridge connects Williams Township, PA. with Phillipsburg, N.J. It is the most heavily travelled of the Commission’s 18 vehicular river crossings. The bridge is one of the most heavily traveled interstate trucking routes in the United States, connecting North Jersey’s port facilities with the warehousing destinations of Pennsylvania’s Lehigh Valley. A total of 24,920,291 vehicles crossed the bridge (both directions) in 2016 – a daily average of roughly 68,100 crossings. The bridge consists of twin-span structures; one carrying eastbound traffic and the other carrying westbound traffic. Each structure consists of seven spans. The superstructures are constructed of four welded steel plate girders with a 10-inch reinforced concrete decks. Girders are supported on Y-shaped reinforced concrete piers. Each bridge roadway is 48-feet wide, consisting of three 12-foot lanes flanked by four-foot-wide and eight-foot-wide shoulders. In addition to the bridge, the Commission’s jurisdiction includes 2.25 miles of I-78 in Williams Township, PA. and 4.2 miles of I-78 spread across Phillipsburg, Alpha, Pohatcong and Greenwich Township, NJ. The Commission’s I-78 Toll Bridge has some of the highest truck volumes of any river crossing in the United States. About 6 million trucks traveled across the bridge in 2016. More than 75 percent of these trucks were five-axle tractor trailers (18 wheelers). Due to the heavy truck volumes and high speeds on this roadway segment, motorists are urged to view the following educational video about sharing the road with tractor trailers. The video is courtesy of the American Trucking Associations. The following 60-second video provides tips for driving safely in construction zones.